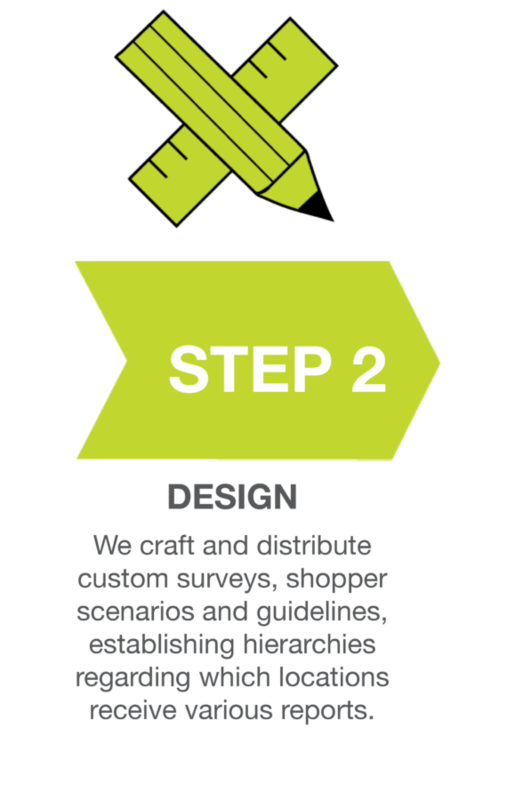 Seelevel HX’s 2017 Drive-Thru study covers 11 national quick-service brands (QSR) and four emerging or fast-casual concepts that are challenging the status quo. In this article, we share the key outcomes and compare some of the data with the results from 2016 (for those companies that were in our 2016 study as well). Arby’s is heavily investing in technology to further improve drive-thru speed. Digital menu boards, speed-of-service timers, and mobile app integration are all playing a role. We’re curious to see how this plays out in 2018! Carl’s Jr. achieved a speed of 270 seconds (one more than in 2016) while Hardee’s landed last in our 2017 ranking with 288 seconds. Interestingly, both saw a significant drop in the accuracy score as well – they were down to to 90.9% and 88.1% respectively. Like Arby’s, Hardee’s and Carl’s are looking to integrate mobile ordering, making it possible for customers to order and then pay before they even reach the pick up point. Chick-fil-A is one of the few companies that was able to improve speed in 2017, to 251 seconds, shaving off 7 seconds from last year’s 258). They lost their #1 spot for accuracy to McDonald’s, but at 93.4% are still a close second. Elizabeth Dixon, manager of hospitality at Chick-fil-A told QSR Magazine “team members can be nice and friendly in the drive-thru while also being quick and accurate.” On top of that, they are doing things like taking note of the description of each car placing an order to help with accuracy. McDonald’s is this year’s winner in the accuracy category with a 93.9% score, up from 92.2% in 2016. McDonald’s was the only brand where three windows were open for service during an average of 95% of the visits. While accuracy increased, delivery time increased almost by half a minute, from 209 to 238 seconds, making it the largest year-over-year increase in our study. 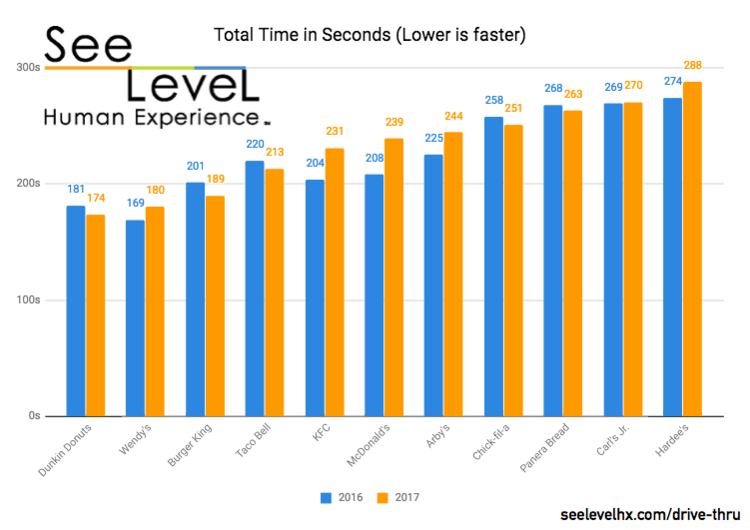 Taco Bell improved speed by 7 seconds to 213 in 2017 while losing a bit in accuracy, going from 91.7% in 2016 to 90.4% in 2017. Taco Bell is on an ambitious growth path to 8,000 stores in the US by 2022. Maintaining consistency and speed through standardized processes is crucial for success,Mike Grams, Taco Bell’s COO told QSR Magazine. Last year’s fastest QSR – Wendy’s – came in second this year at 180 seconds (up 11 from 2016). And just as we see accuracy drop when speed goes up, for Wendy’s this year accuracy increased from 86.9% to 89.7%, a feat that only three other restaurants achieved this year. 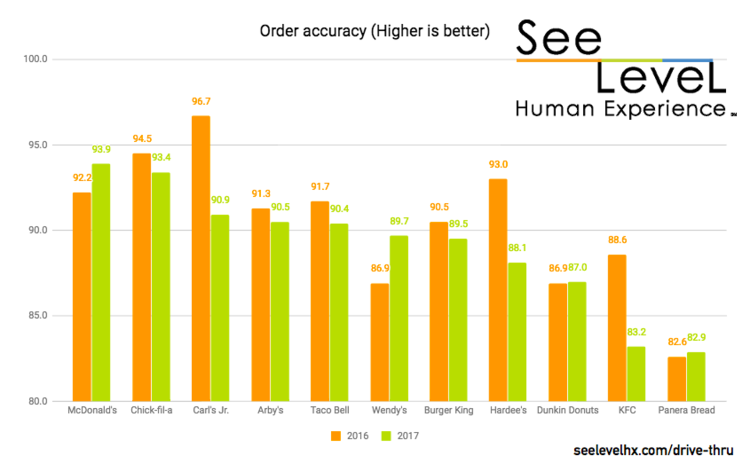 McDonald’s is the new leader in accuracy but with a lower score (92.9%) then last years winner Carl’s Jr, who dropped to third place at 90.9%. We collected data from 2,011 visits for the 2017 QSR Drive-Thru Study with the following breakdown by chain: Arby’s (169), Burger King (171), Carl’s Jr. (88), Chick-fil-A (183), Dunkin’ Donuts (169), Hardee’s (84), KFC (167), McDonald’s (179), Panera Bread (76), Raising Cane’s (75), Starbucks (168), Taco Bell (167), Tim Horton’s (76), Wendy’s (165), and Zaxby’s (75). Visits were conducted across the country, across 156 markets. No restaurant location was visited more than once. All data was collected between June 1 and July 30, 2017. Daypart analysis was based on the time of day of the visit—breakfast (5–9 a.m.), mid morning (9–11:30 a.m.), lunch (11:30 a.m. to 1:30 p.m.), late afternoon (1:30–4 p.m.), and dinner (4–7 p.m.). The distribution of visits mirrored revenue by daypart. Upon each visit, a data collection specialist surveyed the drive-thru lane and then entered the line as any other customer. Each order placed by our researchers consisted of one main item, one side item, and one beverage. A minor special request was also made with each order, such as beverage with no ice. Although two different speed-of-service times were recorded for each visit (one for the researchers’ order/experience and another from a randomly selected vehicle), all tables within this feature are related to the researcher’s’ own vehicle and experience only, as this was the controlled order. Service time was defined as the time from stopping at the order station to receipt of all items (including change). Additional data collected by each researcher included but was not limited to: order accuracy, drive-thru and exterior appearance, speaker clarity, and customer service. All purchases were made using cash so as not to influence timing.